Little Quick Fire from Proven Winners flowers about a month before other hydrangeas. White flowers transform to pink-red as summer progresses. This dwarf plant fits easily into any landscape, including container gardens. Add it to your existing hydrangea garden to extend the hydrangea season. 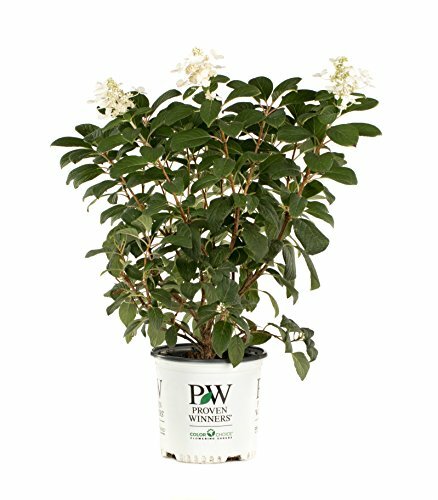 Little Quick Fire Hydrangea from Proven Winners is a dwarf version of the popular Quick Fire hydrangea, producing white summer flowers that turn to pink. Its flower color is not affected by soil pH. Prefers partial to full sun (4+ hours) and well-drained soils. Grows to be 3-5 feet tall and wide. At time of shipment, this plant will be about 1 year old. Blooms from early to late summer with white flowers that turn pink. Prune in late winter/early spring. One gallon shrubs are 6-18 inches tall when they are shipped, depending on the season. Hardiness zones: 3-8. Be sure to check your USDA Hardiness Zone if you want this plant to come back year after year. Hand-picked by experienced shippers and delivered fresh from the greenhouse in a 1 gallon container. Plants shipped from November through March will arrive dormant. Proven Winners guarantees all of its plants are correctly packaged in specially designed boxes, arrive in good condition and are accurately labeled. Use this hardy hydrangea in any landscape, as a mixed border, or as a showy specimen or foundation plant. It can also be used as a cut flower. To introduce the most unique, highest quality plants, Proven Winners are tested for years in gardens across the world. Our plants are unsurpassed in terms of flowering, growth and garden performance. If you have any questions about this product by Proven Winners, contact us by completing and submitting the form below. If you are looking for a specif part number, please include it with your message.